This dish is so simple and it doesn't really have a name. But because it's so refreshing (since you eat the tofu cold) and bursting with flavor, I thought I'd call it Summer Tofu. While it's not even warm yet, I just had a craving for this today. It's a quick and healthy lunch. Furikake Rice Seasoning (optional), and Green Onions. Cut the tofu into one-inch squares. teaspoon of Sesame Oil over tofu. Finally, garnish it with green onions. Optional: Sprinkle Furikake over rice. 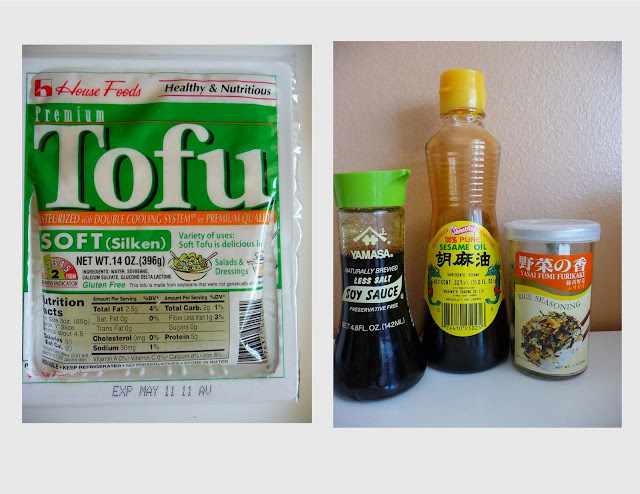 I love this,I should get me some tofu and furikake soon.I followed you from the foodie blog roll and I'd love to guide Foodista readers to your site. I hope you could add this tofu widget at the end of this post so we could add you in our list of food bloggers who blogged about ideas on how to serve tofu,Thanks! Thanks for letting us know! The widget's been added. What a great idea!